Pierre Le Moyne (1661-1706), Sieur d'Iberville, French Canadian soldier of fortune, departed Brest, France aboard La Badine on October 24, 1698 to locate the mouth of the Mississippi River from the Mexican Gulf and establish a French presence on the Gulf Coast to discourage Spanish and English incursions into the area claimed byLaSalle for France. Some French strategist feared that if the English controlled the mouth of the Mississippi River that their holdings and commercial enterprises, including the lucrative fur trade of interior North America were doomed. Iberville and fleet departed Ship Island for France in May. He left a garrison of seventy-six men and ten officers under Sauvolle Fort Maurepas. February 6th, the French establish Fort de La Boulaye (Fort Mississippi) on the Lower Mississippi, near Phoenix, thirty miles below New Orleans. Jean-Baptiste Le Moyne (1680-1767), Sieur de Bienville in command of fifteen men. 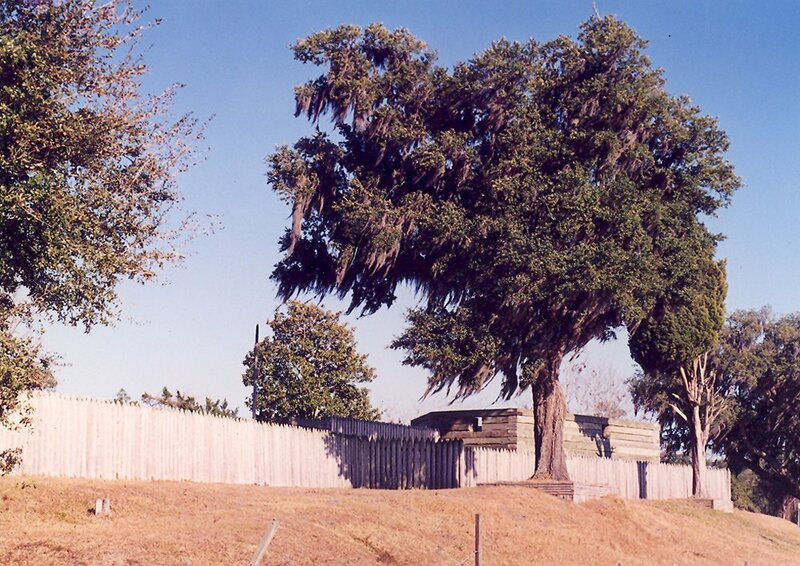 First French establishment in present day Louisiana. Position abandoned 1707, with Juchreau St. Denis in command. On March 26th, Iberville, Tonty, and Bienville, interpreter, met with three Chickasaw and four Choctawchiefs at La Mobile to establish a peace between these warring tribes and discourage them from trading with the English. He gave each Indian nation the following: twelve muskets; 200 pounds of black powder; 200 pounds of bullets; 200 pounds of game-shot; 100 axes; 150 knives; kettles; glass beads; gun flints; awls; and assorted hardware. Iberville died at Havana on July 9th. Natchez founded by the French. John Law (1671-1729), a Scottish economist, granted charter through his Compagnie l'Orient to a monopoly on trade in Louisiana. Law lost his charter in 1722, through bankruptcy. Reorganized as Compagnie des Indies. Office of Royal Governor ceased-Superior Council ruled Louisiana until 1731, when Compagnie des Indies gave up control. French move their base of operations from present day Ocean Springs [Vieux Biloxi] to present day Biloxi [Nouveau Biloxi]. Bienville relocated to New Orleans from Biloxi. Bienville commissioned Governor of Louisiana Colony. The French and Indian War was the last of four major colonial wars between the British, the French, and their Native American allies. Unlike the previous three wars, the French and Indian War began on North American soil and then spread to Europe, where Britain and France continued fighting. Britain officially declared war on France on May 15, 1756, marking the beginnings of the Seven Years' War in Europe. Native Americans fought for both sides, but primarily alongside the French (with one exception being the Iroquois Confederacy which sided with the colonies and Britain). The first major event was in 1754. Major George Washington, then twenty-one years of age, was sent to negotiate boundaries with the French, who did not give up their forts. Washington led a group of Virginian (colonial) troops to confront the French at Fort Duquesne (present day Pittsburgh). Washington stumbled upon the French at theBattle of Jumonville Glen (about six miles NW of soon-to-be-established Fort Necessity, and in the ensuing skirmish, a French Officer (Joseph Coulon de Jumonville) was killed, news of which would certainly provoke a strong French response. Washington pulled back a few miles and established Fort Necessity. The French forced Washington and his men to retreat. Meanwhile, the Albany Congress was taking place as means to discuss further action. Edward Braddock led a campaign against the French in 1755; Washington was among the British and colonial troops. Braddock employed European tactics: bold, linear marches and firing formations. This led to disaster at the Monongahela, where the French and natives, though heavily outmanned and outgunned (the British had a heavy cannon), used superior tactics (using the trees and bushes as cover) to gun down and rout the British. Braddock was killed; Washington, despite four close calls, escaped unharmed and led the survivors in retreat. Major French victories continued at Fort William Henry, Fort Duquesne, and Carillon, where Montcalmfamously defeated five times his number. The only British success in 1755 was the taking of Fort Beausejour by ColonelRobert Monckton, thus protecting the Nova Scotia frontier. An unfortunate consequence of this was the subsequent forced deportation of the Acadian population of Nova Scotia and the Beaubassin region of Acadia. 1756 brought with itWilliam Pitt, Secretary of State of Great Britain. His leadership, and France's continued neglect of the North-American theater, turned the tide in favor of the British. The French were driven from many frontier posts such as Fort Niagara, and the key Fortress Louisbourg fell to the British in 1758. In 1759, the Battle of the Plains of Abraham gave Quebec City to the British, who had to withstand a siege there after the Battle of Sainte-Foy a year later. In September of 1760, Pierre François de Rigaud, Marquis de Vaudreuil-Cavagnal, the King's Governor of New France, negotiated a surrender with British General Jeffrey Amherst. General Amherst granted Vaudreuil's request that any French residents who chose to remain in the colony would be given freedom to continue worshiping in their Roman Catholic tradition, continued ownership of their property, and the right to remain undisturbed in their homes. The British provided medical treatment for the sick and wounded French soldiers and French regular troops were returned to France aboard British ships with an agreement that they were not to serve again in the present war. Though most of the North American fighting ended on September 8, 1760, when the Marquis de Vaudreuil surrendered Montreal — and effectively all of Canada — to Britain (one notable late battle allowed the capture of Spanish Havana by British and colonial forces in 1762), the war officially ended with the signing of the Treaty of Parison February 10, 1763. The treaty resulted in France's loss of all its North American possessions east of the Mississippi (all of Canada was ceded to Britain) except Saint Pierre and Miquelon, two small islands off Newfoundland. France regained the Caribbean islands of Guadeloupe and Martinique, which had been occupied by the British. The economic value of these islands was greater than that of Canada at the time, because of their rich sugar crops, and the islands were easier to defend. Spain gained Louisiana, including New Orleans, in compensation for its loss of Florida to the British.